The sales funnel as it relates to Internet marketing has been defined in many different ways over the years, but without content marketing as the backbone of the funnel, it’s a wasted sales exercise that only produces a site map and wire frame for marketing. Contrary to popular belief, a company’s online sales funnel should not be artificially defined by the company, but rather defined by the content its prospects and customers consume over time. However, the sales funnel has to start somewhere. So upon initial website launch, redesign or campaign launch, companies should take their best stab at developing a working sales funnel strategy; keeping in mind that it will evolve based on the behavior of website visitors over time. Generally, the content consumed online by a prospect will be different based on where they reside in the buying cycle and what perceived challenges they're trying to overcome. By continuously sculpting on-page barriers to content consumption, marketers can identify, qualify, segment and score website conversions. This is also necessary to build a true, working content marketing sales funnel. Some of these barriers can include privacy, time, work, money, topic and inbox. Just because someone visited a website doesn't mean they're in a sales funnel yet. They need to convert first. According to HubSpot, 96% of website visitors aren’t ready to buy. Most visit websites to consume some type of content in order to solve a problem or be entertained. The content consumed by a visitor who has not yet converted can be described as having no on-page barrier to consumption. Content of this nature can be blog posts, press releases, company news or standard web pages. Website visitors aren’t officially at the TOFU until they opt-in to consume content. Otherwise, the visitor is just an IP address and not a person. TOFU could be someone filling out a form to establish a free membership for content access, to watch a short video or to download a guide, whitepaper, cheat sheet, etc. This type of content can be characterized by having a low barrier to consumption. To access it necessitates pertinent visitor information defined by the form fields and its consumption is generally quick and easy. 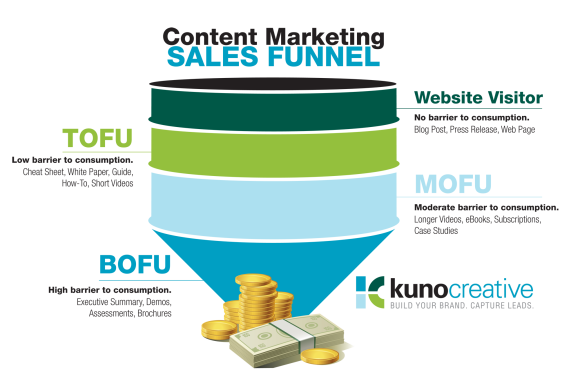 Offering up MOFU content is a way to test the interest level of a website visitor and can allow for the identification of possible actionable leads. MOFU content should have a moderate barrier to consumption. The form can be longer and ask more qualifying questions, and the level of commitment to consume it should be greater than TOFU content. Some examples include subscriptions, ebooks, webinars, longer videos, etc. BOFU content has the greatest barrier to consumption and should represent a major buying signal to the campaign. This can represent a greater time commitment, but often times it's content that is only desired by someone trying to make a purchasing decision. The content could be an executive summary, a sales kit, a free assessment or signing up for a demo. When BOFU content is consumed, the website visitor is either a real opportunity or a rival looking for competitive intelligence. By analyzing the past online behavior of current customers, companies can identify which content was consumed at each stage of the sales funnel and when consuming led to prospects moving from one stage to another; eventually becoming a customer. 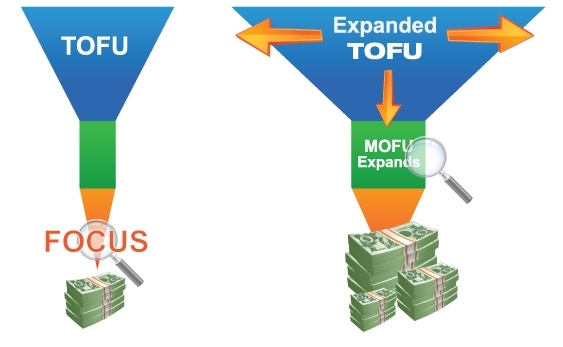 Once all of the TOFU, MOFU and BOFU content is identified and segmented based on persona or category, a true multichannel (email, social media, mobile, website, etc.) lead nurturing campaign can be deployed; delivering the right content, to the right person, on the right channel, at the right time. By properly leveraging content marketing and lead nurturing, a company’s sales funnel will widen and the prospects' journey through it will be accelerated.